When a ship enters service it has an implied or calculated design fatigue life. Factors including construction quality, loads, material performance, and operational profile are assumed. However, these factors vary through life. Failure of structural items due to fatigue cracking can lead to increased cost of ownership and reduced capability. Therefore, to allow informed decision-making, it is necessary to monitor the variables that influence a ship’s fatigue life. This paper presents a new method whereby in-service data, fleet maintenance reports, and Finite Element Analysis are incorporated to predict the fatigue life and hence support the management of the remaining service life of a ship. The method is applied to a naval High Speed Light Craft to demonstrate its merit. 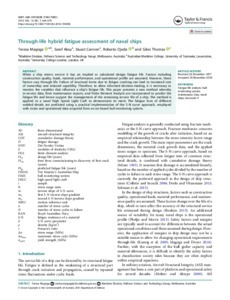 The fatigue lives of different welded details are predicted using a practical implementation of the S-N curve approach, employed with strain and operational data acquired from an on-board hull monitoring system.